Kingfisher Genus fossils dating back 2 million years have been found in Alachua County, Florida. Photo courtesy of William R. Cox. 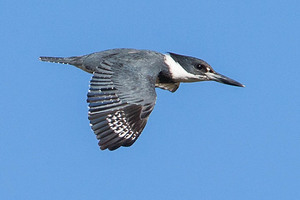 The belted kingfisher is common on Sanibel from August through February. Photo courtesy of William R. Cox. The belted kingfisher (Ceryle alcyon) is a slate-blue chunky bird with a large bill and crested head. 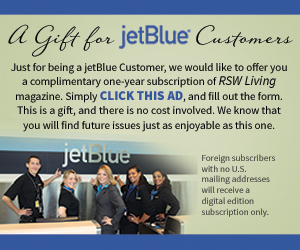 It is 11-14 inches long with a wingspan of 20 inches and weighs 140-170 grams. The female is more colorful than the male. Both sexes have bluish upper parts with a blue-gray breast band and white collar. The female has a rusty breast band and flanks. The long bill is gray at the base and black on the distal half. It has white underwings and a small white patch just forward of the eye. Its legs are short with small feet. 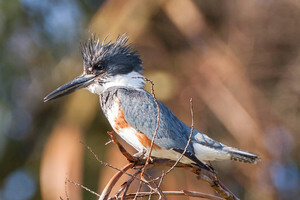 The belted kingfisher is the most widespread kingfisher in North America. It breeds in the Florida panhandle from April through July. It can be observed in central and south Florida from July through April when it migrates from its breeding grounds to winter in south Florida. It is common on Sanibel from August through February and rare in May and June, with occasional sightings in July. It can be seen perched on power and telephone wires and utility poles that parallel flooded roadside ditches. It inhabits cypress swamps, marshes, hardwood swamps, wet prairies, agricultural environments and salt marshes. It can be found along rivers, swamps, lakes, ponds and any open-water wetland. When feeding, it dives headfirst up to two feet deep. Its prey consists mostly of fish, such as minnows, killifish and shiners. Other prey includes crayfish, insects, frogs, tadpoles, reptiles, aquatic invertebrates, young birds and mice. It dives for food either from a perch such as telephone lines, utility poles or tree branches, or while hovering over the water. It also dives into the water to escape raptors. It has a distinctive rattling call resembling a machine gun. Photo courtesy of William R. Cox. The belted kingfisher is monogamous during the breeding season but pairs with different mates in subsequent seasons. 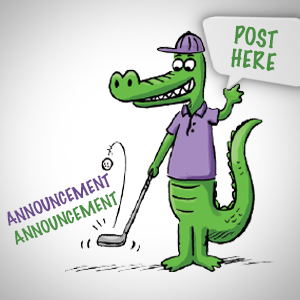 It selects nesting sites along waterways that have vertical earthen banks of sand or sand-clay mixture. It places its nest site in association with bank swallows (Riparia riparia) and produces one to two broods. Both sexes excavate a burrow with a diameter about the size of a grapefruit and two to six feet long, though sometimes up to 15 feet long. The male spends twice as much time as the female excavating the nest burrow. It generally takes three to seven days to finish the nesting site, but may take as long three weeks. The nest burrow is horizontal or angled slightly upward. Some nests are placed in hollow trees. Both sexes incubate four to five white eggs, sometimes six to eight eggs. The eggs are 1.4 inches in size. Incubation takes 23-24 days, and young will fledge 23+ days after hatching. The young are altricial in that they are helpless when they hatch, with closed eyes and bare pink skin. Both adults feed regurgitant to their young. Parents teach their young to fish after they fledge by dropping dead meals onto the surface of the water to be retrieved. At 10 days post-fledging, the young dive for live food and the parents force them to leave their natal territory. A captured fish will fill the bird’s throat, and rapid digestion will allow the fish to inch down its gullet. Nestling belted kingfishers have strong acid stomachs that digest bones, fish scales and arthropod shells. Just before they fledge, however, their stomach chemistry changes and they start regurgitating pellets containing bones, fish scales, hair, feathers and arthropod shells. These pellets accumulate in the nest chamber and can be found near roosting and fishing perches. Scientist can examine these pellets to determine what the belted kingfishers are eating without ever watching the birds feed. The wide-ranging belted kingfisher has been observed as an accidental in Greenland, Iceland, the Azores, Netherlands, Galapagos Islands, British Isles and Hawaii. Pleistocene fossils of belted kingfishers have been found, some as old as 600,000 years, in Florida, Virginia and Tennessee. Kingfisher genus fossils dating back 2 million years have been found in Alachua County, Florida. 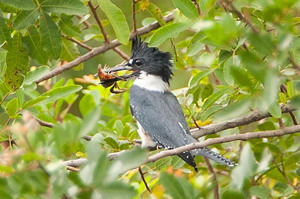 Hawks, mammals and snakes prey upon the belted kingfisher. Its population is stable but has declined locally as nest sites are abandoned because of human disturbance. Its population also declined as a result of being hunted and trapped at fish hatcheries and trout streams. Fortunately, legislation made these practices illegal. Written by William R. Cox, who has been a professional nature photographer and ecologist for more than 35 years. Visit him online at williamrcoxphotography.com.